Forum Home - > Off Topic > Chit Chat Things that put a smile on your face today! Feeling not alone anymore and wanting everyone to be happy too. Waking up and realizing its Friday!!! Watching the celebration of my Queen's 60th Jubilee. Proud to be a Canadian First Nation and loyal subject of Her Majesty. When the RCMP came out on their horses, made me smile from ear to ear. When I lived in the UK, it made me so warm and fuzzy to see the Queen's horse, Burmese when she rode her in publice. Burmese was an RCMP police service horse that was born in Saskatchewan and trained in Ottawa. Burmese kept her Majesty from falling when she was attacked by a man with a gun. Burmese's training kept her steady despite the panic that ensued after the gun was fired. It was nice to see the progeny of Burmese at the celebrations. May you have many more years Ma'am! I was glued to the TV all Sunday watching the Jubilee celebrations (someone really needs to talk to BBC about their coverage, though! ). HM looked smashing on the Gloriana. It looked like HRH the Duke could barely control his glee! 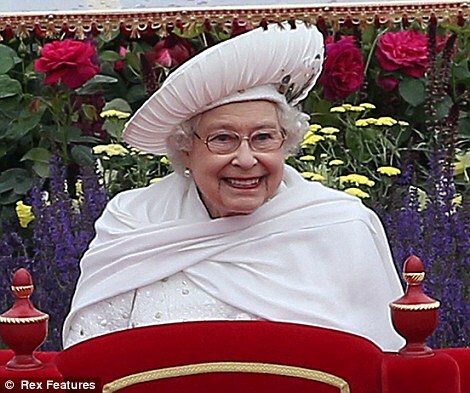 G-d willing, here's looking forward to HM's Platinum Jubilee!!! Not only is it Friday, but it's a short day - closing the office at 4:00! I was thinking of doing the same thing! Thunder and lightening around me everywhere. friend of mine just brought me 200 new Simplicity patterns!!!! that moment when you get an idea for color combinations or beadwork patterns!! That moment made me smile, now i just need to remember it!! Write it down so you don't forget!! 2 of my friends bought me a used dryer... I am having so much fun doing laundry at my own home! oh that"s a great gift!!!!! !...It's hard to find one day to get it all done at the laundry mat, and you save so much time being able to do a little at a time as needed...YOU HAVE SOME VERY THOUGHTFUL FRIENDS THERE!!!! Creator gave me a wonderful extended family in those friends... I am a blessed woman, indeed! Feeling humble awe for a great power touching me once again connecting me to something good. I got my new computer at work today! Its a lot faster than my old dinosaur! That makes me smile. closing up shop in a few minutes. Its friday! Thinking about this past weekend....had a blast!